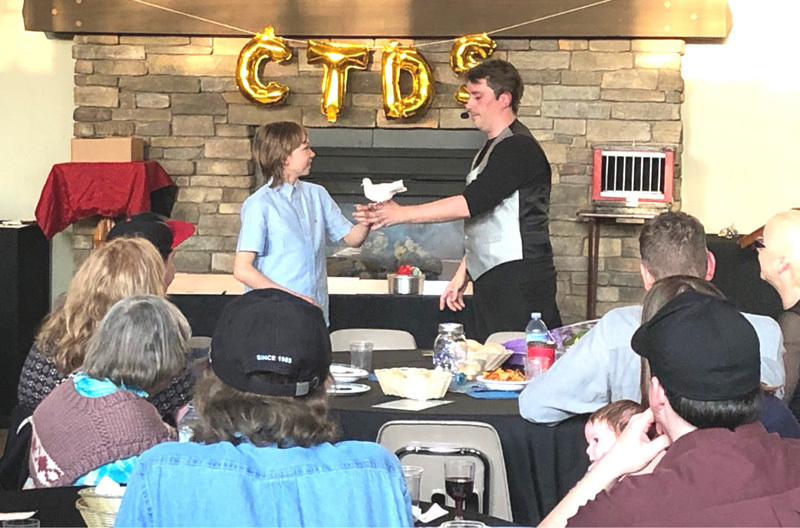 The Community Therapy Dogs Society (CTDS), showed their gratitude for their 90 volunteers during the third annual Appreciation Night for Volunteers at Camp Chestermere on April 5. Throughout the night, CTDS President, Steve King gave a presentation about the impact volunteers have made on the community. Everyone enjoyed a meal, shared their therapy dogs experiences, and were entertained by a magician. “It was a good evening all around,” King said. It is important for King to ensure that volunteers know the role they play in the community is recognized, and to thank them personally for the work they do. “From day one we have tried to ensure that our first priority is to make sure the volunteers know that they are appreciated for the work they do, and for the time they donate to the community,” he said. 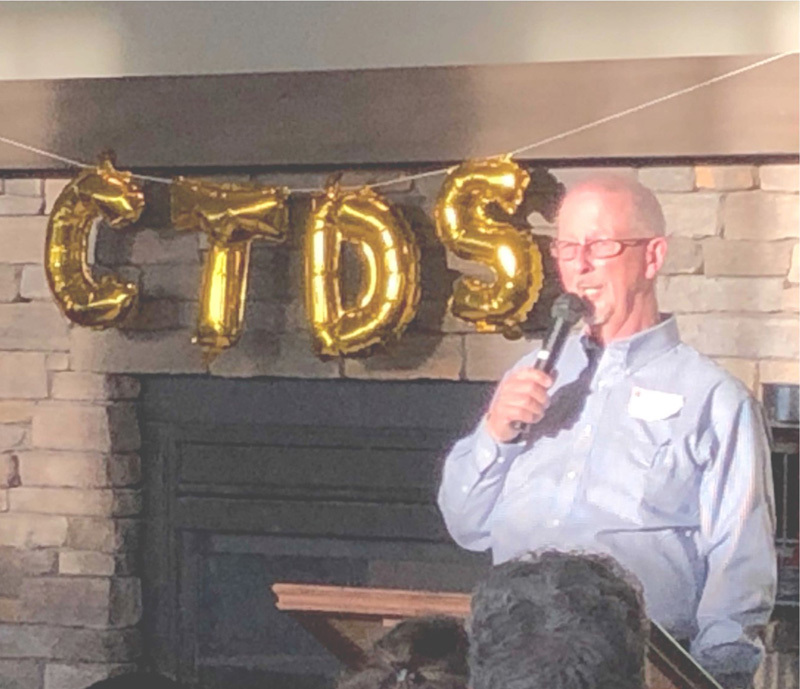 AS well as ensuring volunteers were recognized for their dedication to the CTDS, King also updated volunteers on what’s going on within the organization, and keep volunteers motivated. “The whole atmosphere was very upbeat. We’ve been pleased with the past three years and how it’s gone. The reaction from volunteers has always been extremely positive,” King said. These celebrated volunteers often bring their therapy dogs to schools, hospitals, or seniors’ homes. Therapy dogs will often participate in the Listening Tails program which is designed to help younger kids improve their reading out loud skills by reading to the dogs. King added, if a child is struggling with reading, they don’t always want to have an adult correcting them and making them feel like they don’t know anything. Instead, they can read whatever want to a dog. The dog is not going to be judgmental, and it starts to help them gain confidence. “Reaction from schools is that the kids enjoy reading more, and they also participate in class activities because they now have the confidence to speak out loud,” King said. Along with the Listening Tails program, the dogs will also participate in the Caring Tails program, which is designed to help people going through a stressful situation or visit seniors and hospital patients through the Visiting Tails program. Many seniors have a void where they’ve had dogs in the past, but they can no longer have a dog in their life, and the CTDS is there to fill the void, King said. “I think people generally appreciate the success and the true value of pet therapy overall, especially canine therapy,” King said. CTDS is always looking for people, who are interested in giving back to the community and working with their dogs. “It’s also good for the dogs to have a job to go to,” King said. For more information, please visit the CTDS website at https://www.ctds.ca/.